after running this line you will see your console being populated by a lot of messages showing you what’s going on behind the scene (see next paragraph for more specific info about that). Even if this type is set with “My IP“, if this IP changes (i.e. you connect from another network) it will not update automatically. After trying ramazon (yeah, it worked 😌), @ukituki pointed me out a possible issue: the absence of a public DNS for a given instance. this issue comes from not checking the “Automatically assign a public IP address to your instances” during the launching process. I am already working on some further improving of the ramazon functionalities, like the update function to be run after the first deploy and some other facilities. Nevertheless I would really appreciate you coming back after using ramazon to tell me what you went wrong, preferably opening Github issues, what could be done better and what you would like to see. Andrea Cirillo I currently please myself evaluating credit risk management models and their enhancement mainly within the field of the Basel III capital agreement. I am an '89 catholic guy, married with Francesca, father of Tommaso Gianna and Zaccaria. Hi Simon, thank you for pointing this out. going to update the post. shiny-server-1.3.0.403 is quite an old version and was causing issues, so I changed that to the latest version. Hi Simon, glad to hear that. If you have an updated version of ramazon code you could consider submiting a pull request on github Ramazon repo: https://github.com/AndreaCirilloAC/ramazon. I am here to help if you need advice on this. This would be of great help for the R community and would be surely really appreciate ( I would appreciate it too 😄). Thank you a lot once again. user you’re running this application as. first of all I really apologise for this late reply: I am just changing my job and those have been quite challenging days :). That said, I experienced the same problem while developing ramazon: it was basically due to not installing shiny library at an admin level. This should actually be solved within amazon workflow, since shiny package installation is provided in sudo mode. 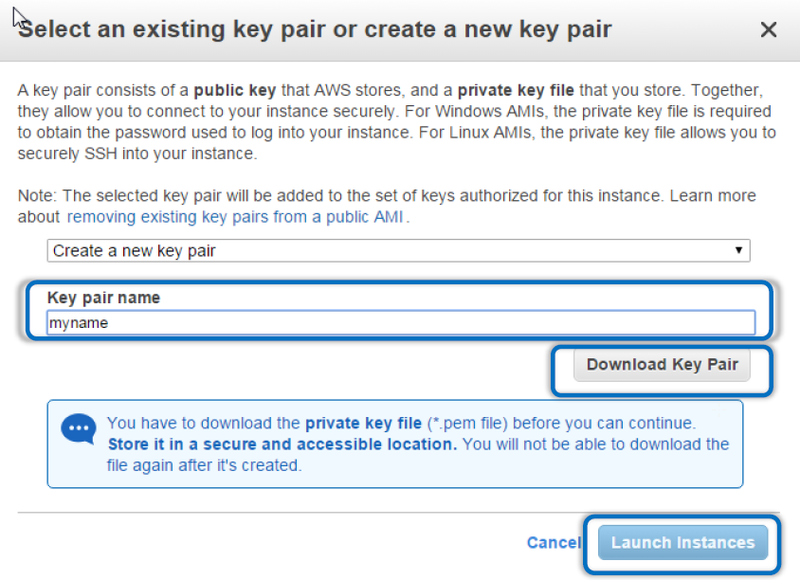 where key_pair_address user_server are the same parameters you passed to ramazon() function. I really hope this will help you and once again apologise for late reply. I am trying to use amazon to deploy my shiny web app. The app collects input from users and saves it in a AWS rds database. Because of this I have had to use “RMySQL” package in my shiny app. I am using a Mac OS X as my development platform. For later readers: issue got solved! Hello. I tried to use this package and it doesn’t work. I am fairly new to R, Shiny and AWS. I ran ramazon() and it worked put the print out url “Failed to open page”. I am using other packages other then shiny. Really thank you for getting back after trying ramazon: it is a really recent package and any help for its developement is really appreciated. 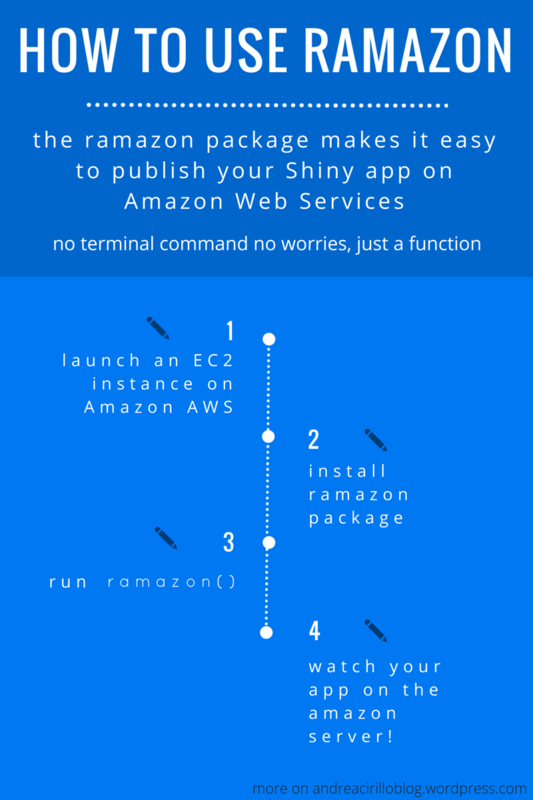 Ramazon is now able to detect and install all packages required by your shiny app. Moreover handling for “one-file” shiny app is available. are you working on a OS X operating system? did you installed latest ramazon version? Thank you once again Johan, I am going to merge the new features you tried within a new package release, so thank you for testing it 😃! Sorry for spamming your blog! No problem at all Johan, really glad you managed to publish your app on the web 😊! if you think it could be something useful for other readers, would you mind to share with us the root cause of your issue ? Thank you anyway and keep on our sharing! 1) does your shiny app read any external file? This kind of error message is usually related to R being unable to read some csv or similar external source. 2) does your shiny app rely on packages different from shiny? The current version of Ramazon installs on the server only this package. I’m almost done with a new release where all required packaged are automatically detected and installed. You can find it on GitHub , develop branch. Nice work! Are you contemplating making it available for Windows users as well? Thank you for commenting Johan! I originally developed Ramazon for personal purposes, therefore only Unix version. That said, since I have received quite a lot of requests from Windows users I am thinking of developing a windows version as well. Really thank you for reblogging it on your blog! I think indeed this provide a great facility for R developers. I’m actually planning to expand the current version with more functionalities, you can stay updated on following the dedicated repository on GitHub : GitHub.com/AndreaCirilloAC/ramazon. Thank you for reblogging it! Hope your readers will found it useful too!